Join in the conversation with our introductory Hot Topics in Education Series, which we intend to be a bi-yearly meeting of graduate students and faculty interested in discussing current issues that exist in education. During this meeting, we will host an informal discussion about the current work that educational psychologists, philosophers, and historians are doing regarding this important topic. Welcome back to OSU for a wonderful autumn semester! Whether you are attending OSU for your first term or you are anticipating graduating in December, we are excited that you have chosen the Department of Educational Studies to be a part of your academic journey.What makes our department so unique is the wide array of programs we offer that share the common goal of impacting education, leadership, and the communities in which we live.We welcome and embrace different cultures, ideas, perspectives, and we are proud to be an inclusive environment for all students, faculty, and staff.We encourage you to engage in diverse conversations that may challenge your own thoughts and ideas; the learning outcomes will be much greater than anticipated. Our faculty and staff are here to be great resources for you and to provide the guidance and support that you need to be academically successful. We want to be a place where you always feel valued and appreciated as a student, and ultimately as a scholar and professional in your field of study. As you begin the new semester, be sure to take advantage of everything the university, the college, and the department have to offer to you. The university has a variety of resources for you to connect socially and interact with other graduate students across different disciplines. Make sure to utilize our department’s student services office for any assistance with understanding department policies, Graduate School procedures/policies, or just needing referrals to other campus resources as well. 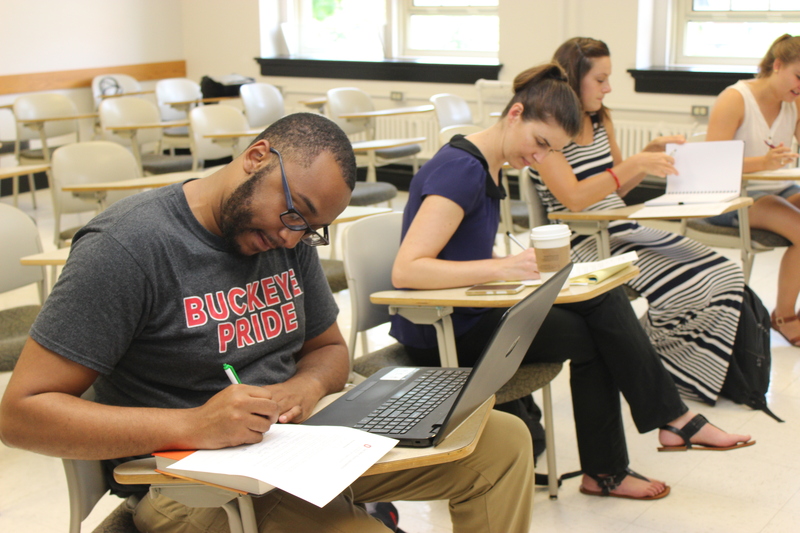 There are many ways for you as a student to get involved and truly experience what it means to be a Buckeye. • Numerous partnerships with OSU’s Office of Student LifeSupport for student well-being and success through the Walter E. Dennis Learning Center, FEEP (the First Education Experience Program), the SMART Lab (for stress management and resilience training), Suicide Prevention program, and numerous other initiatives and programs. We are looking forward to having another fantastic year of triumphs and accomplishments. Join us for a screening of this award-winning film and an evening of dialogue about what matters most for students today. Most Likely to Succeed’s worldwide campaign to re-imagine education. The acclaimed film offers an inspiring look at what students and teachers are capable of- if we have the vision and courage to transform our schools. Directed by acclaimed documentarian Greg Whiteley, the film has been an official selection of two dozen of the world’s top film festivals, including Sundance, Tribeca and AFI DOCS. It’s been featured at leading conferences on education, including ASU/GSV, SxSWedu, Harvard/GoldmanSachs, and NewSchools Venture Fund. Audience members call it the most compelling film ever done on the topic of school. In the past year, more than 2,300 communities have booked a screening of Most Likely to Succeed. The purpose of this event is to foster meaningful discussion among educators, administrators, parents, and students about how current obstacles can be overcome and steps toward change can be taken on a local level. Born out of these conversations is a community-wide commitment to moving forward; transformational initiatives are undertaken and real change is ignited. This event is open to the public. Please visit mltsfilm.org for more information about the film and movement. 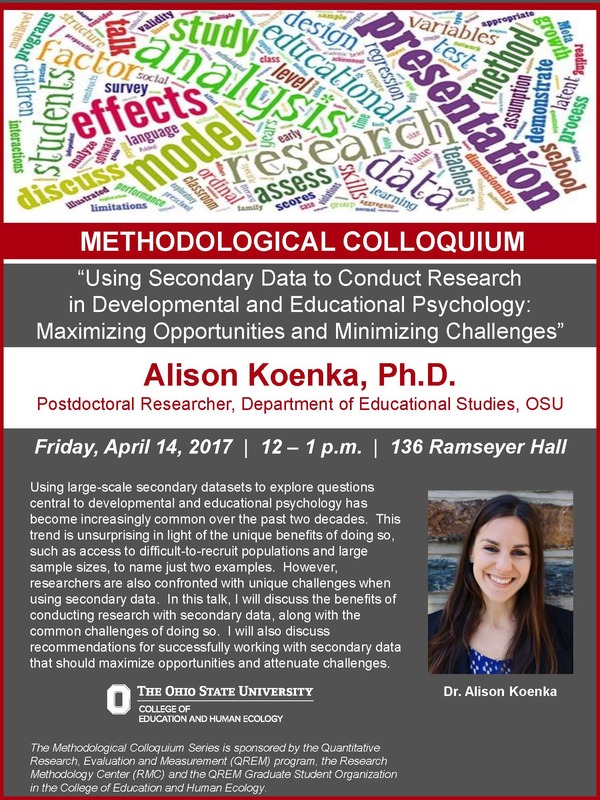 After earning her Ph.D. in Developmental Psychology at Duke University, Alison Koenka joined the Department of Educational Studies as a postdoctoral researcher in July 2015. Alison is interested in motivational consequences of feedback delivered to students across developmental periods and academic contexts. 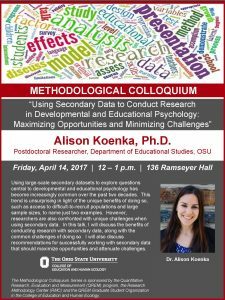 She uses both primary and secondary data, along with meta-analytic methods, to pursue this line of research. The College of Education and Human Ecology and the Department of Educational Studies present the Student Achievement Recognition Awards. We will be presenting the Dr. William E. Loadman dissertation prizes for the best dissertations in each program area. Lunch will be provided. Contact Tiffany Murray.978 with any questions. Graduate Students- please consider attending the expo to support our FEEP program and to interact with future teachers and leaders in education. This semester, we are piloting a FEEP EXPO, in which our FEEP students will display conference style posters presenting the service learning projects they completed in their placements, as well as their decisions regarding their planned future in education based on their FEEP experience. This is a wonderful opportunity for you to meet our students, learn about the impact they had in their field placements, and ask about their FEEP experiences. Details about the EXPO are included below. Please feel free to attend any portion of these events as you are able. The format will be similar to a conference poster session. The lo0cation for the EXPO is the College Commons in Ramseyer Hall 260. Early Childhood Education planned major- students placed in Columbus, Whitehall, Hilliard. Middle and Secondary Education planned major- students placed in Columbus, Whitehall, Hilliard. Early Childhood Education planned major- students placed in Worthington, Upper Arlington, Southwestern, Focus Academy North. Middle and Secondary Education planned major- Worthington, Upper Arlington, Southwestern, Focus Academy North. TESOL, World Languages, Special Education, School Psychology, School Counseling and other planned majors- all districts/schools. 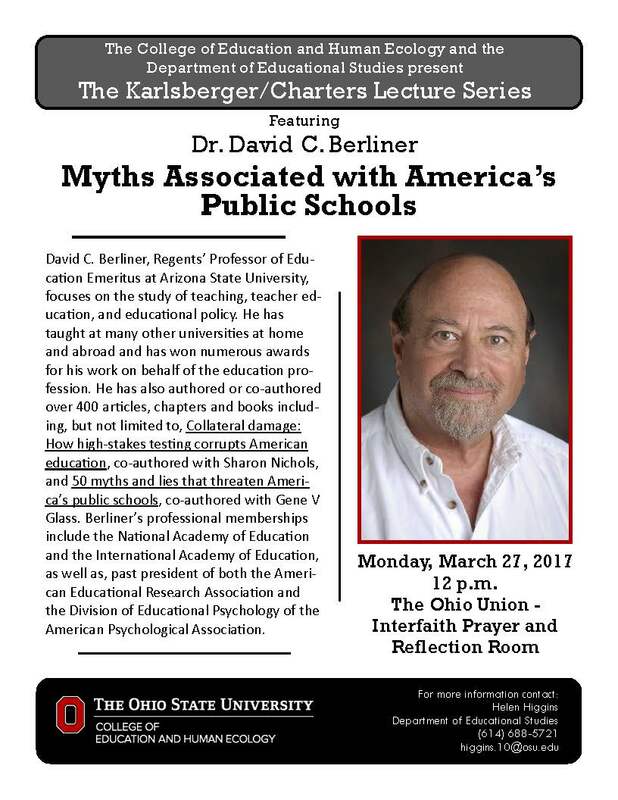 Please join us in welcoming Dr. David C. Berliner as he presents Myths Associated with America’s Public Schools. 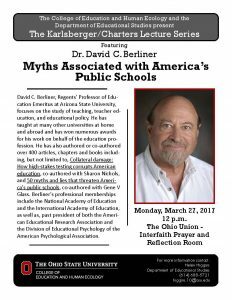 In addition to being a Professor Emeritus at Arizona State University, Dr. Berliner is also an educational psychologist and bestselling author, most recently known for his publication 50 Myths & Lies that Threaten America’s Public Schools. This event is part of the 2017 Karlsberger Lecture Series, sponsored by the College of Education and Human Ecology and the Department of Educational Studies. Seating is limited. 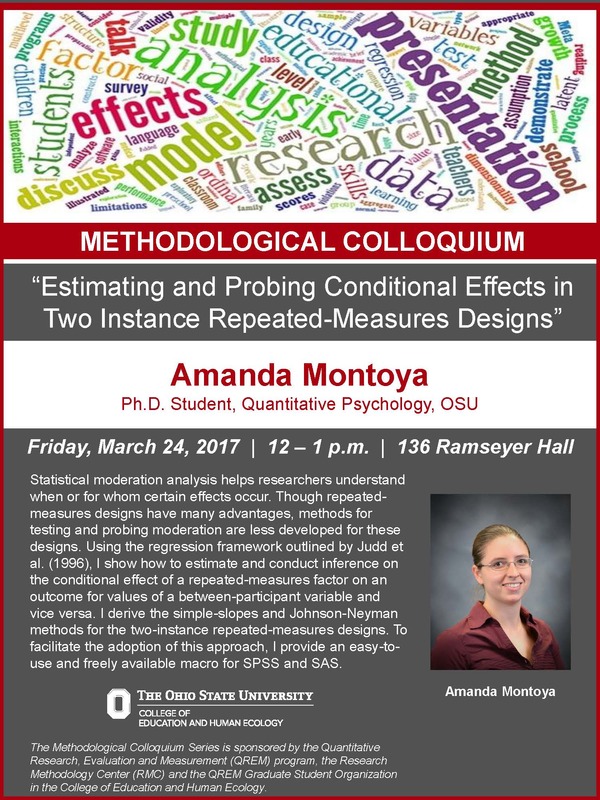 Amanda is a third year PhD student in Quantitative Psychology at the OSU working with Dr. Andrew Hayes. She completed her M.A. in Psychology in 2016 (OSU), M.S. in Statistics in 2016 (OSU) and her B.S. in Psychology with a minor in Mathematics in 2013 (University of Washington). 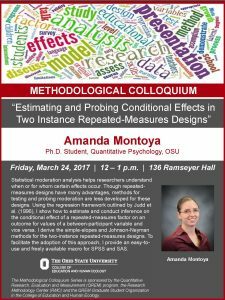 Her research focuses on improving the ability of social and behavioral scientists to answer their questions of interest by using sound statistical methods and developing easy to use tools to encourage researchers to use the most advanced methods available. Her research interests include mediation, moderation, conditional process models, factor analysis, meta-analysis, and stereotyping. Recent publications and CV can be found at akmontoya.com. Check out this great opportunity with Columbus South High School. I hope this email finds you well. My name is William K. Ragland II and I am the School Transformation Facilitator at Columbus South High School working with the Diplomas Now program. Diplomas Now is a proven approach that helps the toughest middle and high schools in America’s largest cities ensure that every student graduates ready for college or career. It is the first fully integrated approach that improves a school’s curriculum and instruction, while it provides the right students with the right support at the right time. The Diplomas Now partnership is comprised of Talent Development Secondary (a program of Johns Hopkins University), City Year, and Communities in Schools. Our goal at South is to increase attendance rates, decrease behavior infractions, and increase course passage rates beginning with students in the seventh grade. South is in the fifth and final year of implementation of the Diplomas Now program. At the end of the 2012-2013 school year, South High School promoted 98% of its freshmen class to the 10th grade on track. This is a 93% increase from the previous year. Of 44 schools in 12 cities nationwide implementing the Diplomas Now school turn around model, South quietly earned Diplomas Now High School of the Year honors last year because of its efforts. During the 2013-2014 South High School 10th grade students scored remarkably well on the Ohio Graduation Test. We saw double digit gains in every subject tested, including thirty-percent gains in reading and writing respectively. We also promoted 90% of our freshman to 10th grade on time. South High School was awarded the prestigious Straight “A” Fund Grant from the Ohio Department of Education. Our first cohort (2016) of Diplomas Now students graduated last school year. Eighty-eight percent of the graduating class had experienced the Diplomas Now program for three or more years. Our graduation class ranked among the top 10 high schools in the district. Our Freshman Matriculation last school year rate ranked among the top 5 high schools in the district. As a part of the Diplomas Now program we will be conducting quarterly report card conferences with our seventh through twelfth grade students. We are looking for business and community leaders that are willing to come speak with individual students about their second quarter report card. Our second quarter report card conference will take place on January 26th , 2017 from 8:00- 10:30am in the school cafeteria. You do not have to stay the entire time if you have other conflicts; any time you can give is greatly appreciated. I will provide a brief training on how the conferences are to be conducted beginning at 8:00am on January 26th. If you can attend please confirm your attendance by emailing me at wragland@jhu.edu or calling me at 614-365-5541 ext. 223. Please feel free to contact me if you have any questions or concerns. Please share this invite with any of your friends or colleagues that may be interested in attending. At the end of 2016-2017 school year, the Diplomas Now program as currently constituted will be leaving South High School. I would like to “Thank you” all for your support of the program and most importantly your support of the students at South High School. I know this invite is later than I usually send it. I just returned from paternity leave. I hope you can still make it. Thank you for reading this email. Together we will make a difference at South High School and in Columbus! Once again the EHE Office of Research will oversee the Dissertation Research Fellowship program for the 2017-2018 academic year. We wanted to get the process started early in the semester, so that applicants have sufficient time to assemble their packets. At this time, Educational Studies will plan on nominating two (2) candidates for one (1) dissertation year fellowship. The EHE Office of Research website already has posted the application guidelines for the Fellowship. They can be found at http://go.osu.edu/EHEfellowship. Applicants will need to provide a cover letter, up to a 6-page application, letters of support from their dissertation advisor and two other faculty members, a CV, and a Graduate School advising report. The award includes a stipend as well as tuition for dissertation credit hours for Fall and Spring of 2017-2018. The advisor should comment on other sources of funding that might be necessary to complete the dissertation. The evaluation of the proposal by the advisor and the two other faculty members should focus on the demonstrated scholarship and future potential for scholarly excellence. Evidence of previous research productivity is an important consideration. Note that these awards can be held simultaneously with other external fellowships (e.g., Spencer dissertation fellowship) and are intended to support your top doctoral candidates. The deadline for students to submit their packet to Deb Zabloudil is January 20, 2017. Please submit the documents electronically to Zabloudil.1@osu.edu. When you view the web site, it will tell you to submit your documents to Dr. Jan Nespor’s office. Please don’t do that. Submit them to me instead so I can take them directly to the Graduate Studies Committee for review. Although students need not be candidates at the time of application, they must be candidates by the end of Summer Session 2017 to be eligible to receive the award. Students who have previously received the Dissertation Fellowship award are not eligible for consideration of continued support.